Award-winning author Chen Qiufan's Waste Tide is a thought-provoking future vision of how climate change affects the world. Mimi is a 'waste girl.’ A member of the lowest caste on Silicon Isle, located off China’s southeastern coast, and home to the world’s largest electronic waste recycling center. There, thousands of miles from home, Mimi struggles to earn a living for her family and dreams of a better life. Luo Jincheng is the head of one of three clans who run the island, a role passed down from his father and grandfather before him. As the government enforces tighter restrictions, Luo in turn tightens the reins on the waste workers in his employ. Ruthlessness is his means of survival. Chen Kaizong, a Chinese American, travels to Silicon Isle as Scott’s interpreter. There, Kaizong is hoping to find his heritage, but finds only more questions. The home he longs for may not exist. As these forces collide, a dark futuristic virus is unleashed on the island. 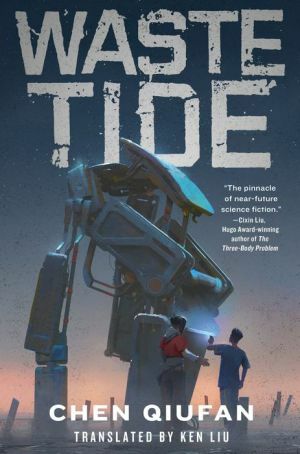 Against the backdrop of a gritty near-future Chinese landscape, in a world of body modifications and virtual reality, a war erupts -- between the rich and the poor; between ancient traditions and modern ambition; between humanity’s past and its future.